Click on image to download course brochure. You have an approved SMS Implementation Plan, but now what? 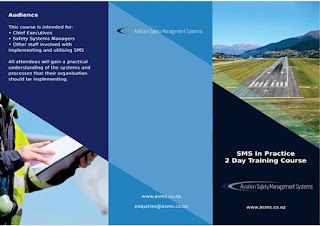 ASMS is pleased to announce two more dates for our popular 2 day practical SMS course. Extensive use is made of case studies and practical exercises to demonstrate how an effective SMS can work in practice. You will benefit from experience gained implementing SMS for multiple Group 1 organisations, with trainers that also understand the constraints faced by small organisations. "Well worth attending. Some excellent stuff to get our process rolling." "Great course, instruction was on point." This course is intended for Chief Executives, Safety Systems Managers, and other staff involved with implementing and utilising SMS. Places are limited, book now to reserve your place. For drone courses, click on the above course titles to go to our UAV training website, or register using the above links. Please email us to enquire about custom courses. (c) Aviation Safety Management Systems Ltd 2016-2018. Powered by Blogger.